Primary Technology is committed to helping provide a safe and protected online experience for children. We recognise that a large amount of online safety is based around guidance and teaching that parents, carers and schools provide. Through our website and other materials we intend to provide up-to-date, comprehensive and accessible information and resources. If you think there is anything else we could include, amend or expand upon please contact us – we are actively working with and looking for experienced professionals to build a fantastic free starting point for schools. 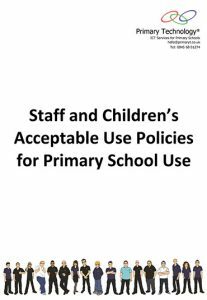 Here we have available some ready to use Acceptable Use Policies. Feel free to download the zip file which has both the Microsoft Word and Open Source editable documents ready for you to amend or hand pick the elements which you require. Below are some tools and resources that you can use to make your lives a little easier, pass on to others and help identify any other needs you may have in school. Free and friendly Google search. A set of resources and tools created by the Child Exploitation and Online Protection Centre (www.ceop.police.uk). It’s split into age ranges and has specific parent and teacher information. Great resources for everybody, including some fantastic stories for younger ones and a glossary for parents. The 360 esafety self review tool – helps you identify what your requirements are and where to move forward. Tips, advice and resources to help children stay safe on the internet. Engaging videos to highlight various online safety issues. Videos and advice aimed at KS2 and above. Every parent needs a little control and easy to access advice. The below sites should help people at home take a grip on esafety and get clued up about the technologies they own. Additional safety tools for your home Windows PC or Laptop. Microsoft account required. More information is available here. A great page with links to Parental Control help for many commonly used technologies.